Patchwork Paisley Printed Plus Size Blouse is rated 3.4 out of 5 by 5. 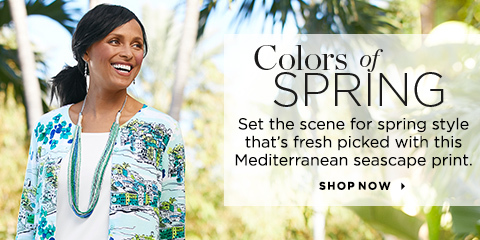 A patchwork print brings a bold mix of colorful patterns to this relaxed-fit blouse, making it a perfect match for capris and sandals. Rated 2 out of 5 by Nation561 from Love the Colors-Not the Fit I love the colors of this top, but am disappointed in the fit. I have always bought size 2x and have not had any problems. This top in size 2x is slightly snug tight in the bust and does fit around my hips. I haven’t returned it because I think a 3x will be too big in the bust and it will still not fit around my hips. Rated 3 out of 5 by NC Granny from Beautiful pattern; sleeves too short This is a beautiful shirt; I love the colors and pattern. However, the sleeves are short and gaping. Not good for a plus-size woman! Rated 4 out of 5 by Teresa34 from Great fit I Love shopping at Christopher and Banks. Their clothes are made for bigger people. Not just a bigger size but tailored to fit plus size people. Rated 4 out of 5 by retired grandma48 from Nice dressy top! Gave this top to my daughter in the teal color. She loved it! Waiting for my own top in the purple color! Rated 4 out of 5 by pjalley from love the colors I love the colors of this blouse! I had a hard time deciding which color to order.